ALPINE, Texas — Ramtech Building Systems, a design-build commercial modular firm, based out of Mansfield, Texas, announced May 1 that the company finished the installation phase on a new eight-room classroom building modular for Alpine Christian School. The 8,064-square-foot facility will be open to students at the start of the 2018-19 academic school year as the new building is purposed for teaching kindergarten to 12th-grade students. The school had previously rented from a local Alpine church for student space, but the lease on that space ends May 2018. Additionally, they reached maximum capacity in their classrooms, stressing the administration to find alternate solutions. The school had to raise $100,000 of the $375,500 initial building cost by Sep. 30, 2017 to secure the building. Made possible by the donation of two of the school’s local benefactors, the new modular building will now stand on a portion of the 21 acres the school acquired in 2016 and will now be able to support an increase in enrollment of more than 250 students. 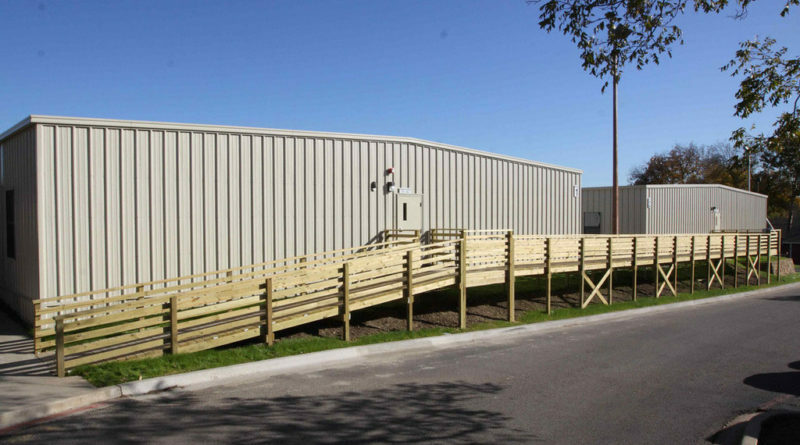 By applying one of Ramtech’s standard classroom inventory designs, the value-engineered facility uses an R-panel metal siding exterior with wall-mounted HVAC units zoned for maximum heating and cooling efficiency, according to a statement. Ramtech’s range of on-site work included the location of the building on a pad arranged by the school’s contractor. Once power is installed to the site, Ramtech will finish the remaining interior work including the vinyl composition tile flooring. Future plans for the remaining acreage include developing the site to feature an astronomy program, a rugby field, running track and an equestrian riding center. Ramtech has specialized in modular building construction since 1982, successfully completing more than 3,500 projects. By combining the off-site manufacturing process with the on-site application of the interior and exterior finishes, Ramtech is able to produce relocatable, yet permanent modular school buildings faster and with lower design and construction costs, while having the same features, functionality and longevity as compared to completely site built structures, according to Ramtech’s website. The Alpine Christian School is a non-denominational Christian school located in Brewster County, an area in southwest Texas. The school was founded in 2004 with six students, and teaches a core of knowledge using a classical model based on the Trivium of grammar, logic and rhetoric. In 2013, it was accredited by the Texas Alliance of Accredited Private Schools, making it the only fully accredited private school in the Big Bend tri-county area.